While Cyndie and I were perusing our woods, collecting materials for the stick fence we are making, I came upon a very picturesque tree. 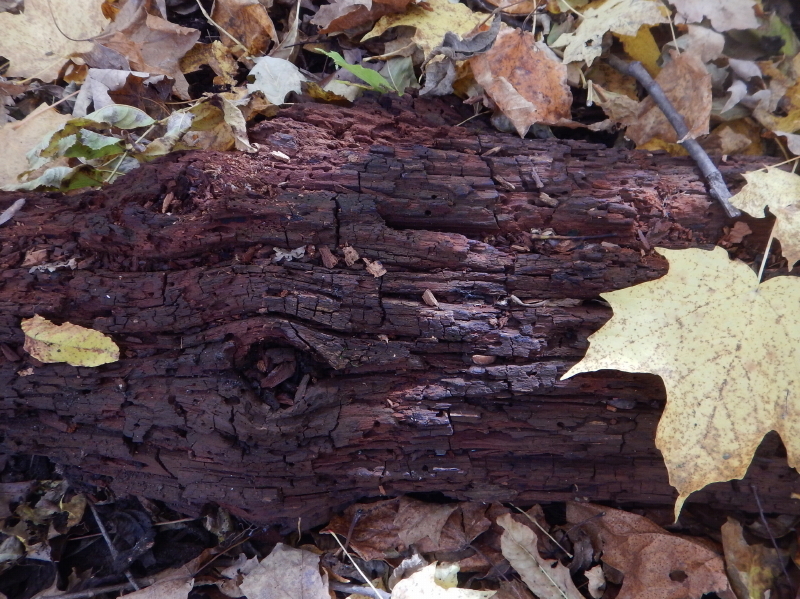 Well, the remains of a tree. As much as we like to clean out downed branches in an effort to tidy up our woods, it’s nice to find occasional examples of nature’s course playing out without our, at times, overbearing intervention. There is something very satisfying about seeing an old tree turning back into the dirt from which it grew. 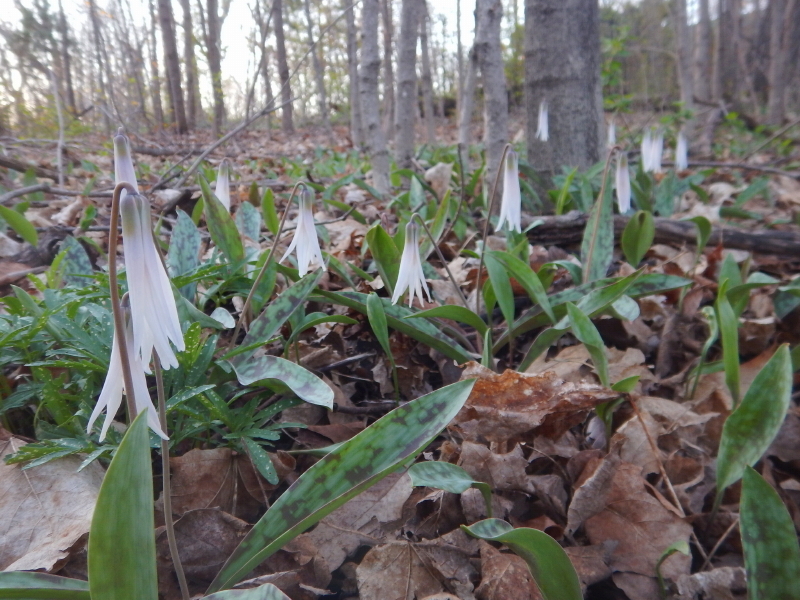 The forest floor is sprouting forth with an abundance of white trout lilies this week. It made me curious about the trillium that we transplanted from our lake place last year. I should have marked them better, because the complete transformation of the woods in a year’s time has me confused now over where I put them. 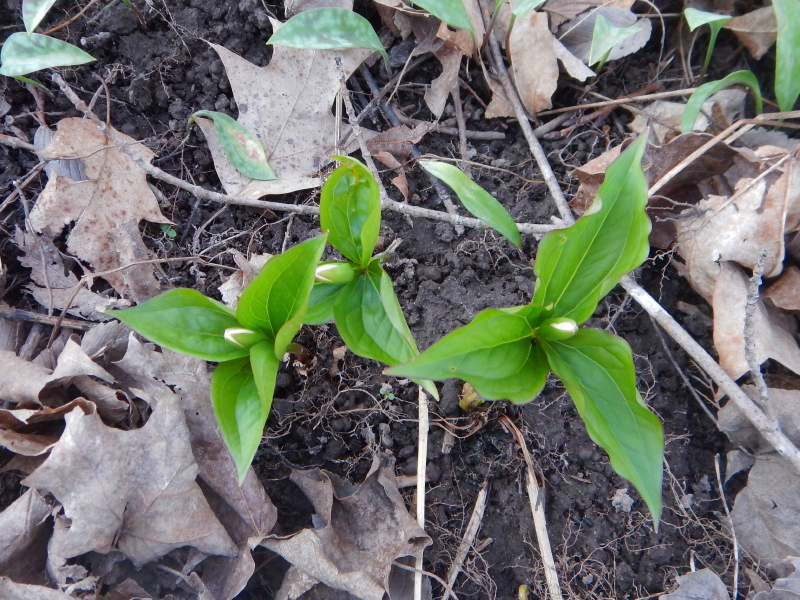 I planted the “borrowed” trillium in several small groups in a section of woods just below the house. Surveying the area late yesterday, it seemed like the only growth was trout lilies, but I eventually spotted a grouping of the distinctly different leaves. In a few weeks, flowers will make the trillium much easier to spot. Up north, it is obvious how prolific trillium is in naturally propagating to carpet the woods and create a dramatic visual. We are hoping to seed our spaces with enough starters to enable the natural process to do the rest. 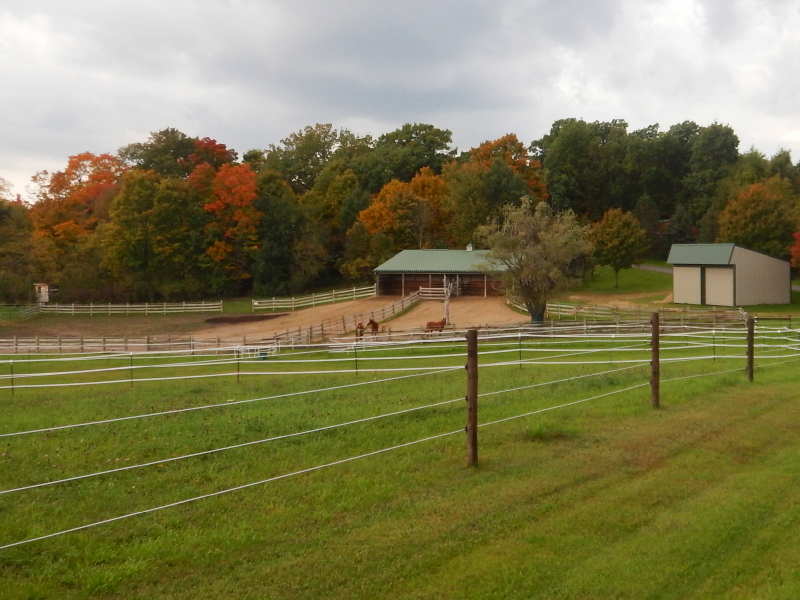 After some passing gentle rain showers on Thursday, the pasture that I mowed last weekend is greening up nicely. 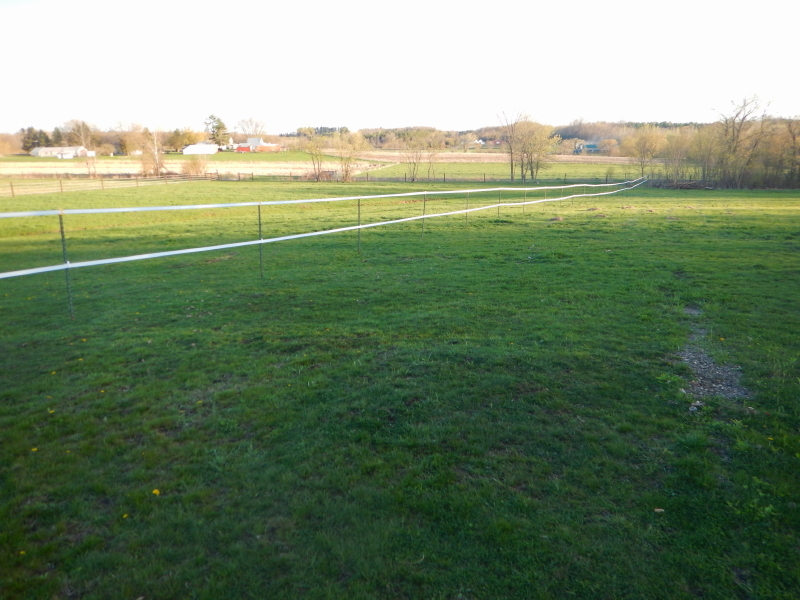 I strung the webbing between posts yesterday to complete the divider fence that will allow us to rotationally graze the horses on that precious field. The point where I connected the new webbing to electricity is right at the paddock, and the horses took great interest in what I was doing. I had the charger turned off to work, and while I experimented with several methods of connection, Legacy and Cayenne took turns putting their noses right into the business at hand. I sure hope they are keen enough to sense the hazard of doing that when the electricity is on. Even though they already had a stint on the alley grass earlier in the day, Cyndie talked me into letting them come out on the pasture with the new divider for a short nibble after so patiently watching me fix it up all afternoon. I can’t really say whether they even noticed the new divider, because their attention was exclusively focused on the succulent green blades immediately available just steps beyond the opened gate. 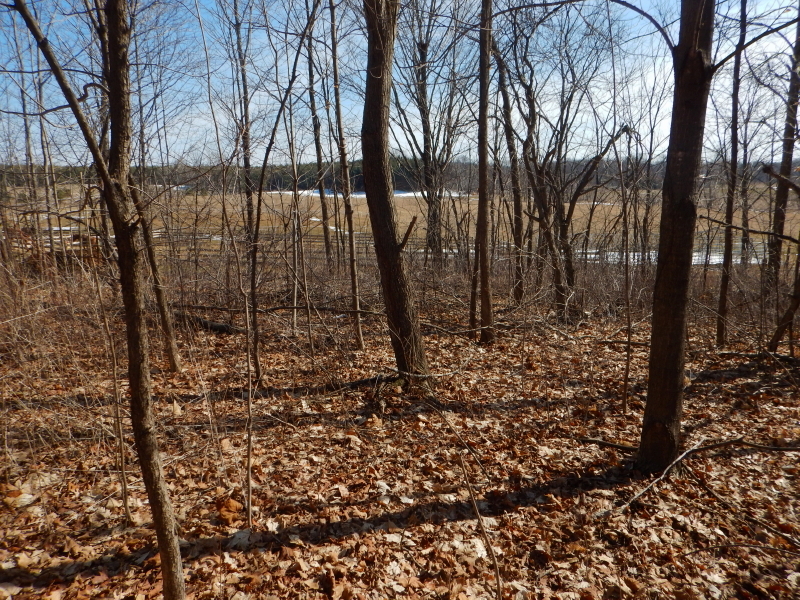 It wasn’t too muddy beyond our trails, among the leaves carpeting our woods, so we took advantage of the favorable weather and did some “forest-keeping” yesterday. Since we were already picking up the branches I had pruned from trees, we got inspired to keep going and clean up some of the years of accumulated fallen limbs and dead growth. It’s like magic. Once you decide to start picking up branches, there suddenly becomes more branches deserving to be picked up. We collected a wide variety of them into piles at the side of our trail, to make it easy for chipping later. We can grind them up right where they lay and spread them out to pave the trail for better footing during the muddy season. Wouldn’t it be nice if we could bring the tractor in there now? But the ground is too soft for the time being. While picking up some branches that had lain there for years, I found myself wondering how I would know when enough was enough. 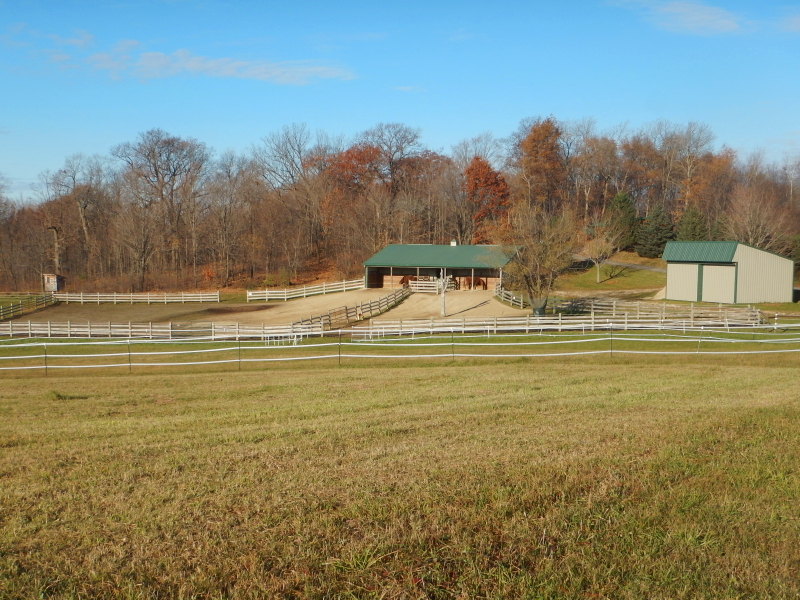 It looked really good in the areas we had cleared, but I felt a desire to avoid trying to make it too pristine. Cyndie agreed with me that we should seek a good balance of making it look well-tended, while maintaining a certain amount of natural character from the few oddities of limbs or saplings that grow askew or have reason to fall. 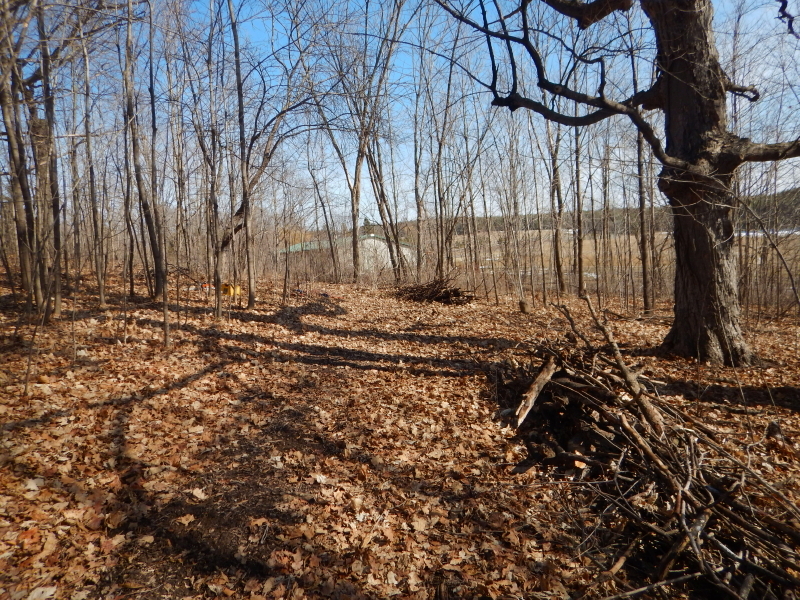 While working to widen the trail we created through the south woods, I recently discovered the remains of an old barbed wire fence. There is no obvious logic to the location of this fence. It is in the middle of the woods. There are so many trees in the area that it is hard to imagine what the fence was originally supposed to be keeping in, or out. 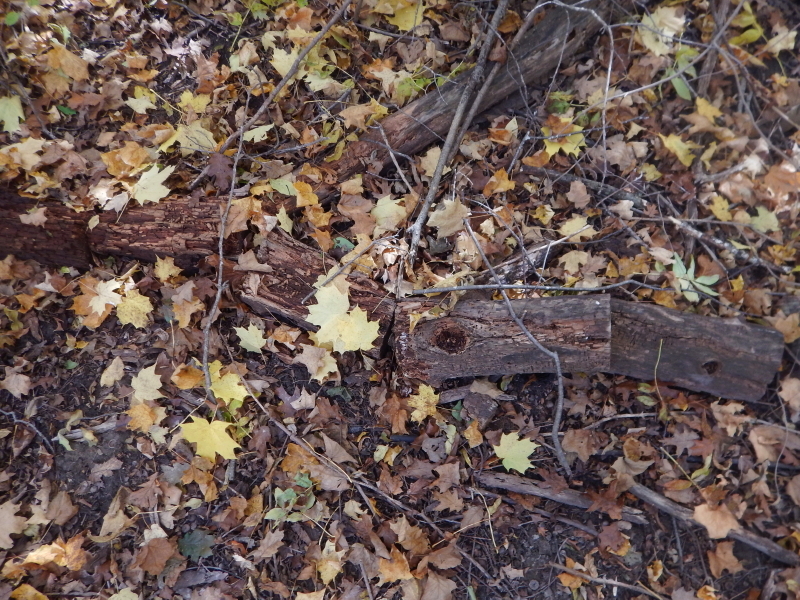 Most of the rusty barbed wire had fallen down and was buried out of sight, beneath the dirt, leaves, moss, and fallen branches that carpet the forest floor. Occasionally, it would rise up to a dangerous level that could become a treacherous surprise to an unsuspecting explorer. It was clear that the fence was from a long time ago because I found a tree that had grown up into one strand, eventually swallowing it entirely, and continuing on undeterred. As I struggled to navigate through thick growth while trying to keep track of the 5 lines of rusted and barbed strands, I came upon an old fence post that still had nails and hooks in it that held on to some of the wires. The post was barely a hint of its original size. It was so weathered it looked more like a walking stick than a fence post. Working with rusted barbed wire is an onerous task. It often breaks unexpectedly. With much of the wire buried, if it breaks when I am trying to pull it up, I have to delicately hunt through the ground cover in search of the portion that remains. When it breaks while we are trying to bundle the lengths that have been cut for removal, the number of pointy ends and loose pieces doubles. That’s on top of the ever-present barbs that constantly poke our gloves and catch on every obstacle possible. 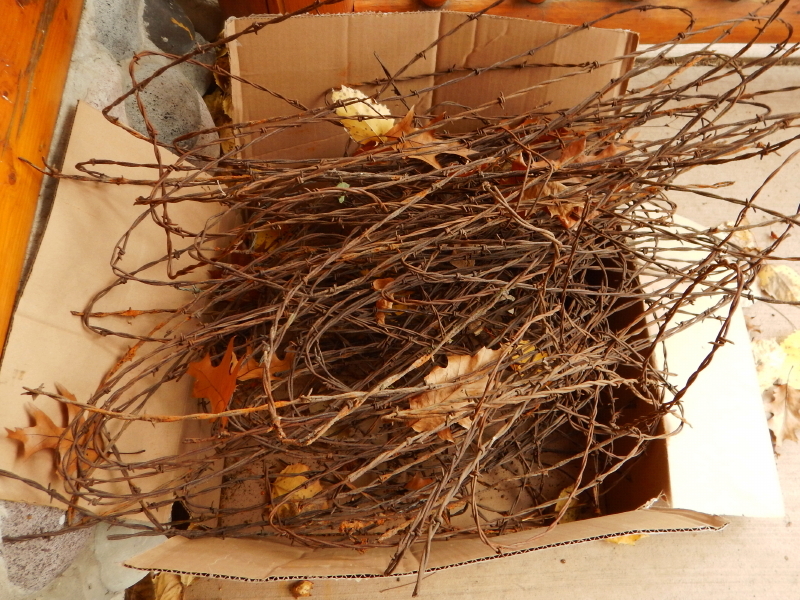 Removing it from the middle of the forest is a major hassle, but rusty barbed wire is a hazard we don’t want to have lurking among the trees, so we find that the torturous effort of removing it is worth it. Now we just have to find a way to conveniently dispose of the bundle. I bet I could find a taker on Craig’s List. I think it belongs in a sculpture by some creative artist. Someone other than me. I don’t have the patience —or the right gloves— for it.